The Gunter Group, a Portland-based consulting firm providing specialized services and solutions for companies of all sizes across Oregon, Washington and Nevada, launched a new website that reflects its recent growth and new brand identity. In addition to a logo and website reveal, The Gunter Group also introduced a new tagline “Thoughtful Action. Tangible Results” to reflect the custom, strategy-first approach to client goals. “We’re so excited to introduce a new brand that symbolizes our connection to our clients in a very tangible way,” said Mike Gunter, founding partner of the firm. “We are continuing to grow to meet our clients’ needs, provide exceptional opportunities for our consultants, and build our communities in the best possible way,” added partner Ashleigh Gunter. The Gunter Group has invested in building additional service lines, including a “People” practice, focused on the process of bringing change into organizations, and a “Technology” practice, directed towards helping clients with more complex technology challenges. The firm continued to expand its team by opening offices in Bend, Oregon, and Reno, Nevada, and will continue growing its presence in new markets in 2019. 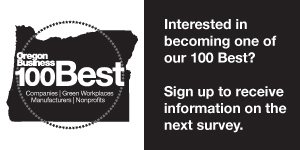 Founded in 2011, The Gunter Group has been recognized by Oregon Business one of the “100 Best Places to Work in Oregon” annually since 2015. Partners Ashleigh and Mike Gunter’s mission is to provide the high-value services to clients while investing in the consultants that make up the firm and the communities in which they work and live.